Blood plays many important roles in the human body. It carries oxygen and nutrients to the body’s cells, helps fight infection, and works to heal wounds. When a disorder inhibits its ability to meet the body’s needs or prevents blood from flowing or coagulating properly, many problems can result. According to the National Heart Lung and Blood Institute, about 9 percent of all U.S. deaths are attributable to blood diseases. 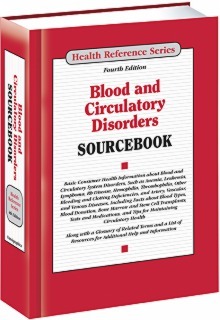 Blood and Circulatory Disorders Sourcebook, 4th Edition, offers facts about blood function and composition, the maintenance of a healthy circulatory system, and the diagnosis and treatment of many common blood cell, bleeding, and circulatory disorders. Blood donation, cord blood banking, blood transfusions, and bone marrow and stem cell transplants are also discussed. Part I: Understanding Blood and the Circulatory System explains the composition and types of blood and how it functions in the body. It describes blood donation and cord blood banking procedures, and it also discusses how aging affects the heart and blood vessels. Part II: Diagnosing and Treating Blood and Circulatory Disorders provides information about medical tests commonly used to identify and monitor blood and circulatory disorders. It offers facts about many of the medications often used in the treatment of these disorders and discusses such procedures as blood transfusion and bone marrow and stem cell transplants. Part III: Blood Disorders describes ailments that affect the composition of the blood itself. These include anemia and other hemoglobin disorders, cancers of the blood, plasma cell disorders, and white blood cell disorders. Information about the causes of these disorders is provided, and treatment strategies are discussed. Part IV: Bleeding and Clotting Disorders provides information about bleeding disorders resulting from insufficient clotting, such as hemophilia and von Willebrand disease, and those resulting from excess clotting, including deep vein thrombosis and pulmonary embolism. Methods of diagnosis and treatment options are included. Part V: Circulatory Disorders describes disorders affecting the veins, arteries, and heart. It includes information about aneurysms, stroke, blood pressure irregularities, atherosclerosis, carotid artery disease, coronary artery disease, heart disease, peripheral vascular disease, and venous disorders such as thrombophlebitis and varicose and spider veins. Information about causes and diagnosis, as well as treatment options, is provided. Part VI: Additional Help and Information includes a glossary of terms related to blood and circulatory disorders and a directory of resources offering additional help and support.